Today was the day - the day I started "fixing" my nutrition and changing my body with the 21 Day Fix. Today was the day that I stopped eating by calories and started eating by portions and by types of foods. I made up my meal plan for the week based on my colored containers and was all set to go. And then the hubby dropped a bomb: he wanted to go out for lunch after church. Now, the Fix allows for eating out on the plan, but I *was* hoping to avoid that...especially at first, not to mention the FIRST day!! I panicked. I took out my frustration on my amazing hubby. I fumed. Next, I thought about delaying my start date. I usually start my new programs on Mondays anyways. It's all good; one more day wasn't going to hurt anything. Finally, I decided to make it work. I tapped into the awesome network of coaches on my team on Facebook, got IMMEDIATE feedback, and figured out exactly what I could eat and what containers it would use. And then, we went out to lunch after church. 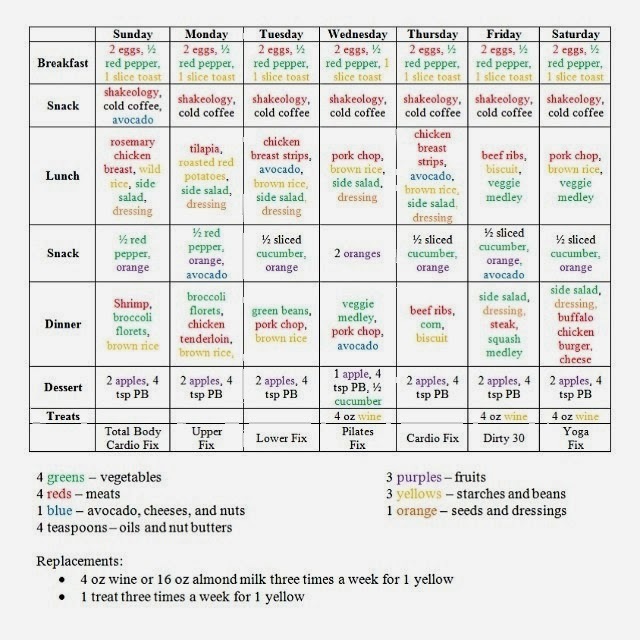 Can we just take a minute to appreciate just how much food I am eating on this plan? It feels like a TON, and I had to force myself to eat it all today. This is definitely NOT a starvation diet! And the workout? In a word, awesome! While I didn't realize it *during* the workout, afterwards my thighs and abs were screaming. I can't remember the last time my abs were actually sore after a workout. That right there tells me it's effective. Can't wait to see where this program takes me!